"The AVEENO® Brand recently launched the PURE RENEWAL™ Dry Shampoo – the Brand’s first Dry Shampoo! In honor of this exciting launch, the AVEENO® Brand has developed the AVEENO® Summer Hair Renewal Sweepstakes! From August 17th through September 28th, you will be able to enter for a chance to win a spa weekend trip for two to NYC, while 1,500 other readers will receive a full-size PURE RENEWAL™ Dry Shampoo prize! Keep your eyes peeled for the August 27th issue of People Magazine (on stands 8/17)! There will be a beautiful page about the sweepstakes." As an added bonus, AVEENO wants to give one lucky ABCD Diaries reader a FULL Pure Renewal line! This giveaway will include the Pure Renewal Shampoo, Conditioner, 2in1 AND the Dry Shampoo! Disclosure: I am a 2012 Aveeno Active Naturals Ambassador. 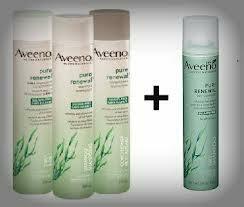 Aveeno is providing the products for this giveaway. I have not received any compensation to write this post and all opinions are my own. Entered the Chicken of the sea. I entered the Lark un-alarm giveaway.